Like the blue color of our sky, HD 189733b gets its hue from light scattering in the atmosphere. However, this particular shade isn’t caused by air. The light is scattered by particles of silicate. That means that the surface is covered in rainstorms, but instead of water, pieces of glass move sideways at five times the speed of sound. Discover more about the worlds waiting in the vast reaches of space with the mind-altering book Exoplanets and Alien Solar Systems at Amazon.com! It’s not only planets that get rain. A contender for prettiest rain in the galaxy is around a proto-star named HOPS-68, a young Sun-like star that’s around 1,350 light years from Earth. It still has a collapsing cloud of dust around it, but scattered among the dust are tiny shards of olivine, a green crystal used to make jewelry, which are raining down on the star as it forms. 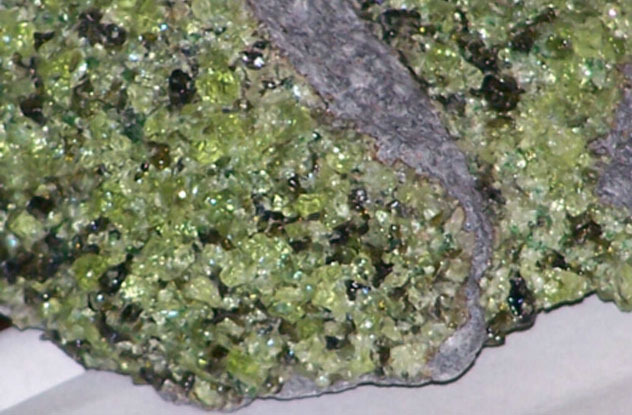 Like many gems, olivine forms at lava-like temperatures. The cloud around HOPS-68 is pretty cold, around –170 degrees Celsius (–280 °F). 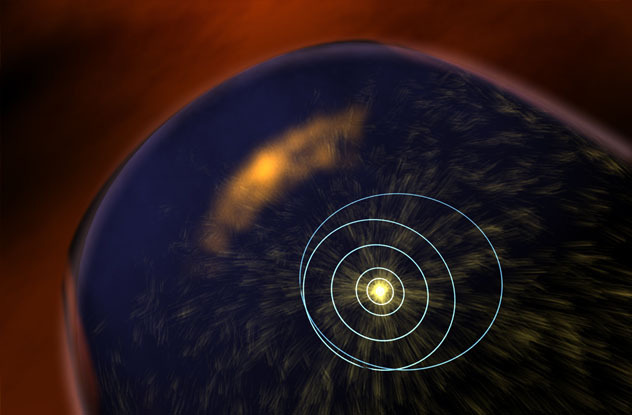 Astronomers think the olivine formed near the star before being blasted out by jets of gas. Now it rains onto the embryonic star, falling “like glitter,” as one scientist put it. The discovery, made by NASA’s Spitzer Space Telescope, helps solve a mystery in our own solar system. Similar crystals were recently found in peripheral comets. The findings suggest that the gems may have been formed in the early stages of our solar system and became frozen in comets after being flung away from the center. Alpha Andromedae, also known as Alpheratz and Sirrah, is the brightest star in the Andromeda constellation. It’s also the holder of another record—it was the first ever star found to have a weather system. The discovery began with a mystery. Alpha Andromedae was one of the first stars whose surface could be examined in detail, and it was found to have patches of mercury whose composition changed over time. In fact, the concentration of mercury in different parts was different by factors of up to 10,000. On our sun, spots and changes in composition are the result of magnetism. Alpha Amdromedae doesn’t have a magnetic field, so a different explanation was needed. Astronomers observed the star for seven years and found that the concentration pattern shifted over time. 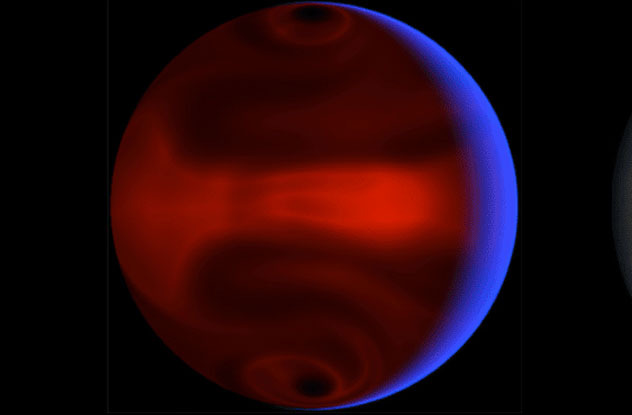 They discovered that the dynamics seemed to match those that cause weather patterns on Earth and planets like Jupiter. 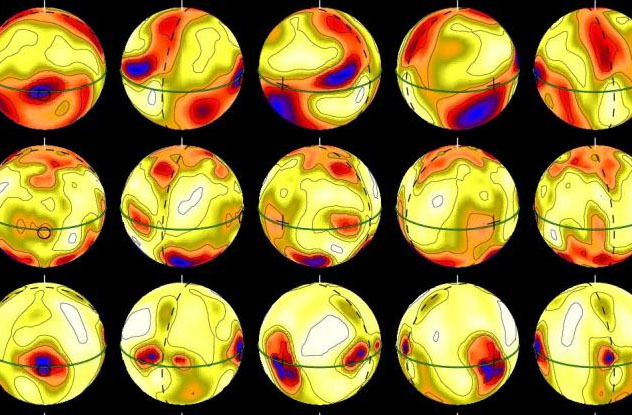 The shifting means that clouds of mercury are moving across the surface of the star. Yet solving that mystery left another. It seems like mercury is the only element in the star able to form clouds. Scientists don’t know why that is. HD 80606b is another hot Jupiter, though it’s four times Jupiter’s mass. The planet is particularly interesting, as it has the most eccentric orbit yet observed. Its 111.4 Earth-day orbit takes it to 0.88 times the distance from the Sun to the Earth. Its closest pass to its star is 30 times closer and lasts for just a matter of hours. A team from Geneva Observatory examined HD 80606b and determined that as it approaches its closest pass, someone floating above the planet’s surface would see the star’s brightness increase by a factor of 825. The result of the extra radiation is that the planet’s temperature more than doubles in six hours, from 527 to 1,227 degrees Celsius (980 to 2,240 °F). That makes it the biggest temperature swing ever observed on any planet. Yet the almost 1,000 fold increase in sunshine doesn’t explain it—it would take a lot more than six hours for such a change to double the temperature of, say, Earth. Scientists figured out that the sudden blast of radiation causes something like an explosion in the atmosphere facing the star. 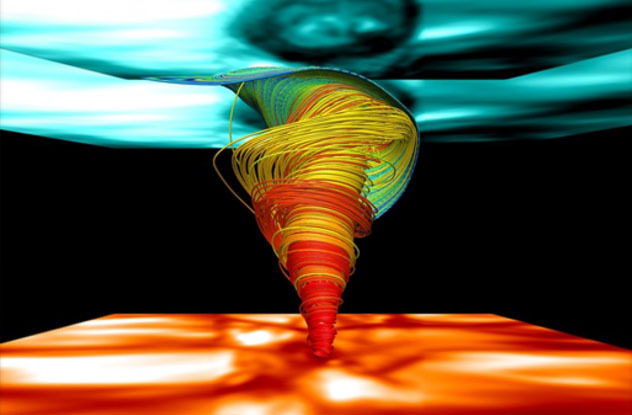 It produces winds of 17,700 kilometers (11,000 mi) per hour across the surface. The spin of the planet then creates giant, swirling shockwave storms that carry the heat around. 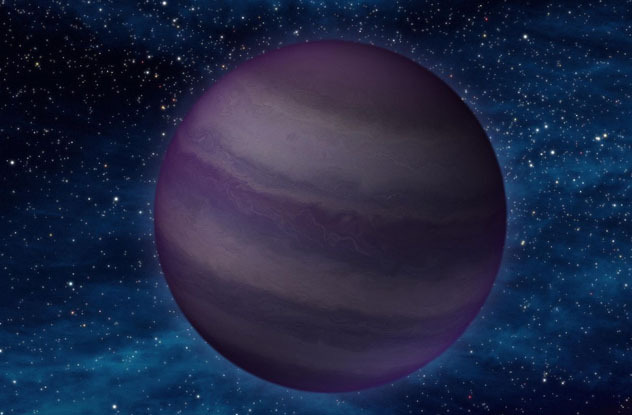 Brown dwarfs form the way other stars do but lack the mass needed to ignite. That leaves them relatively cold—some of them can even be cooler than a human body, in fact. Their low temperature means they don’t glow very brightly, so they’ve often been difficult to find. Humans have built some awesome telescopes, however, and astronomers have been able to use two of them to build a brown dwarf a weather map. Scientists pointed the Hubble and Spitzer space telescopes at brown dwarf 2MASSJ22282889-431026, or 2M2228 for short, which is 39.1 light years away. Scientists found changes in brightness every 90 minutes as the dwarf rotated. Using two telescopes allowed them to observe different wavelengths, revealing that the timing of these changes varied depending on which frequency of infrared they examined. These differences are a result of clouds moving across the dwarf’s surface in storms the size of Earth. 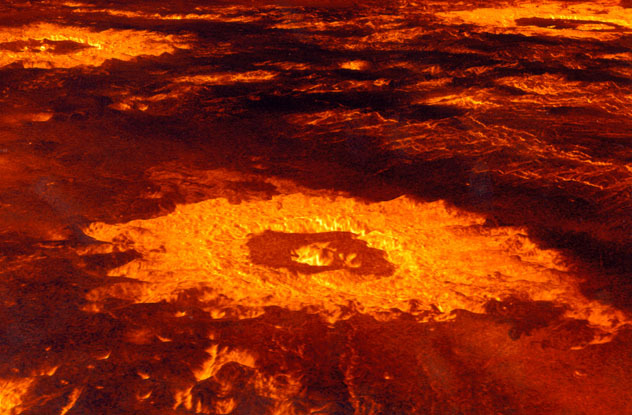 The surface of the dwarf is around 600–700 degrees Celsius (1,100–1,300 °F), so the clouds are made up of exotic material, including sand and droplets of molten iron. NGC 1333-IRAS 4B is a baby solar system. Its central star is still cocooned in an envelope of gas and dust. In the center of the envelope, orbiting the star, is a denser disk of materials that will likely eventually form planets. This center disk is experiencing what can best be described as a hail storm. Enough water to fill Earth’s oceans five times over is raining onto the central disk. The central disk is warmer than the surrounding cloud of material, and when the pieces of ice reach the cloud, they vaporize. This causes the water to glow with infrared light, and that’s why NASA’s Spitzer telescope was able to pick it up. This adds to our knowledge of how planet systems form. This “steamy” phase of a star doesn’t last long, but the presence of water allows scientists to calculate the disk’s size, density, and temperature. The vapor itself will eventually refreeze and possibly end up as comets. You don’t need to look too far to find unusual weather on a star. In fact, our sun is home to magnetic tornados. One of these was measured to be five times the size of the Earth—if it were on Earth’s surface, it would reach halfway to the Moon. These tornados are made of superheated gas and plasma up to 2 million degrees Celsius (3.6 million °F). The winds in the tornado whip around at 300,000 kilometers (186,000 mi) per hour. The first tornado to be filmed was captured in 2011 by NASA’s Solar Dynamics Observatory. Others have been filmed since, and they’ve been found to often come before coronal mass ejections. CMEs are blasts of plasma and radiation that shoot out of the Sun and have also been associated with sunspots. Figuring out how all of these magnetic phenomena fit together is a puzzle currently being probed by NASA’s supercomputers. While not all magnetic tornadoes are 125,000 miles high, around 11,000 of some size rage across the Sun at all times. These smaller, more abundant tornados were only discovered in 2012. They may be part of the reason that the Sun’s corona is much hotter than its photosphere despite being further from the center, a long-standing mystery known as the coronal heating problem. Experience science fiction legend Arthur C. Clarke’s vision of alien weather in the spellbinding novel Rendezvous with Rama at Amazon.com! 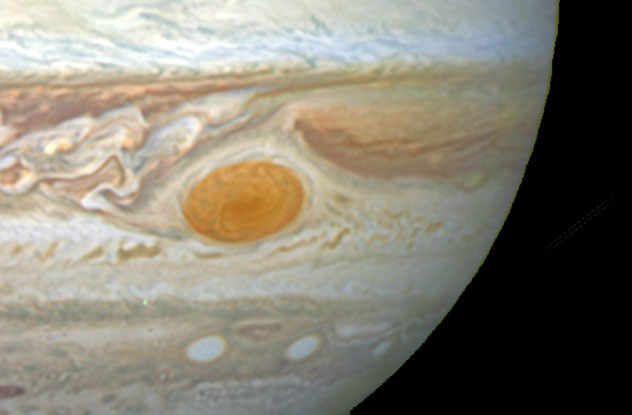 The most famous weather phenomenon in our solar system is the Great Red Spot of Jupiter, a giant storm spotted in the first half of the 17th century. Measurements in the late 19th century suggested it was as much as 40,000 kilometers (25,500 mi) wide. By the time the Voyager probes went by in the late 1970s, that was down by about half. As of 2014, the Hubble Telescope measures it at 16,500 kilometers (10,250 mi) across, compared to Hubble’s first measurement of 20,950 kilometers (13,020 mi) in 1995. All those numbers mean the spot is not just shrinking—it’s shrinking at a faster rate than ever. We can’t yet explain the accelerated decrease, but scientists believe it may result from small eddies interfering with the storm’s internal dynamics. The Juno probe, due to reach Jupiter in July 2016, may provide some answers. 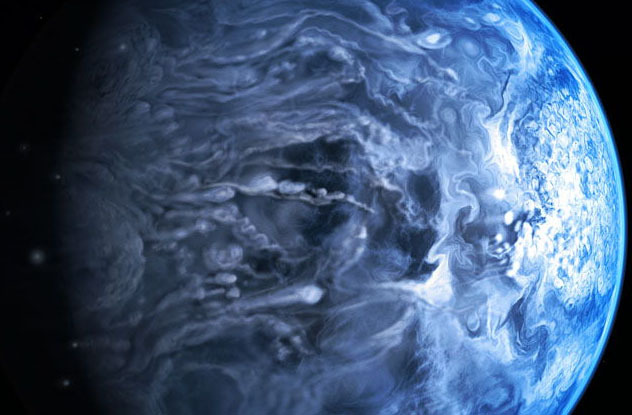 Jupiter is not the only gas giant with massive storms. In December 2010, the Cassini probe began monitoring a newly formed lightning storms on Saturn. The storm traveled westward, leaving a vortex in its wake. Over the course of 201 days, it moved the entire way around the planet and caught up with itself. When it crashed into its own wake, it faded away. The normal weather of Venus is pretty awful. Its thick atmosphere makes it the hottest planet in our solar system. A layer of cloud 20 kilometers (12 mi) thick drizzles rain of pure sulfuric acid. The raindrops evaporate before they hit the ground. To top it off, there are giant space explosions. Really giant space explosions. These are known as “hot flow anomalies” and are caused by the solar wind that typically flows around Venus. However, solar wind doesn’t always blow in a uniform direction. Pockets of plasma can build up where the wind meets the atmospheric boundary around Venus, and they can reach the size of the planet itself. It’s not just planets and stars that have weather—there’s weather in space itself. Coronal mass ejections and solar flares produce a wind of charged particles. When these hit Earth, they cause the famous aurora borealis. They can also cause problems with electronics, especially satellites. Starting in 2014, the British Meteorological Office will offer a 24-hour space weather forecast. While the Sun throws potentially destructive wind our way, it also protects us from a much larger storm. 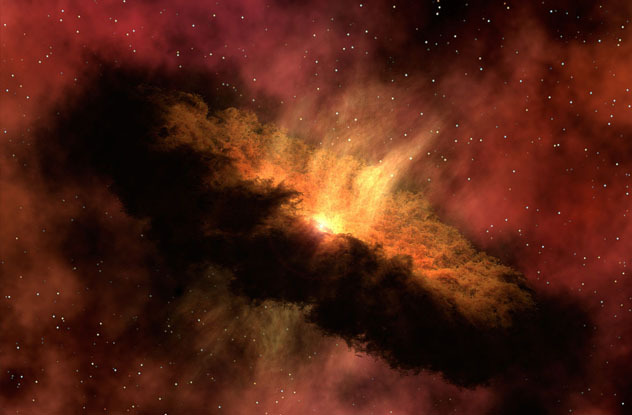 For the last 45,000 years, the solar system has been traveling through a cloud of interstellar gas around 30 light years across. The Sun’s magnetic field, or heliosphere, provides a bubble the same way the Earth’s magnetic field provides a bubble from the solar wind. Recent observations suggest that the cloud is more turbulent than we expected. One possible reason for this is that we’re close to the edge and may be out in another 1,000 years. The most powerful space weather phenomenon, though, is galactic wind. These winds are powered by the formation and destruction of stars and blow hot gas and dust out of galaxies. They can push material hundreds of thousands of light years, and they can escape the gravity of a galaxy entirely. They change how quickly stars form and even change the disk structure of a galaxy.